Carl Frampton believes Saturday’s clash with Josh Warrington could have sold out a stadium but sees preservation of his momentum as the most important thing. Frampton is looking to become a four-time world champion at Manchester Arena when he takes on IBF featherweight title-holder Warrington and ‘The Jackal’ says he is looking to get on with the job as quickly as possible. “This is a big arena – the biggest in the country. The fight could’ve been a stadium fight but I don’t want to wait around for good weather. “I want to keep this momentum I’ve never had in my career. I don’t think I’ve been this busy since 2012 or 2013. It’s incredible to be so active. With big names such as Rocky Fielding, Martin Murray, Jack Catterall and more all in the same gym under Jamie Moore and Nigel Travis, Frampton is revelling in the hubbub. “We’ve got a busy gym at the moment but nobody gets jealous or annoyed because having both Jamie and Nigel means there’s loads of time for the fighters. “One guy works with Jamie, one works with Nigel and others hit the bags. And Paddy Barnes is ready to return fitter and stronger as he bids to take the first step towards a second world title shot on Saturday. 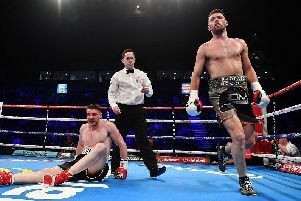 The Belfast fighter was defeated by Cristofer Rosales at Windsor Park back in August but is ready to bounce back this weekend. “I’m really excited to get back in there and get back to winning ways. I want to forget about my last fight and push on to a bigger and better 2019. It’s a massive card. “I’ve been working on a lot of strength since the Rosales fight.